Iron Bonehead Productions have a serious knack of unearthing some of underground extreme metal's best kept secrets. Look what they've done with ZOM for christsake! Today it's the turn of Swiss black/death duo Bölzer. As a band, they've been around since 2008, although they only released their first material in 2012 in the form of their first demo Roman Acupuncture. Initially pressed in limited numbers on both CD and Tape, it was later re-released by Iron Bonehead on on tape in April 2013. Later that year, Aura was released on both vinyl and tape via Iron Bonehead and has had numerous pressing since, with a CD version being handled by Necroshrine Records. While most black/death bands go hell for leather right from the start, Bölzer start off with more of an atmospheric approach on opener C.M.E. The low deathly growls are interspersed with spoken-work screams and the riffs in the background provide menacing melody. The drums are ever-present as well, thanks to the ringing cymbals. This approach to the more brooding, lumbering type of black/death gives Bölzer an edge and one that makes them insatiably infectious. 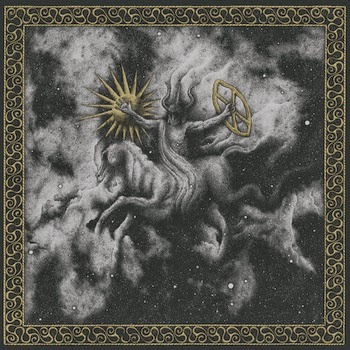 The ringing feedback at the start of Entranced By The Wolfshook points at something all the more sinister, but that orchestral sound that the guitars create remain the staple of Bölzer ’s sound. I still can’t believe this is just a two-piece! The song is mainly instrumental, with the odd vocal blast and tortured scream for good measure. Entranced…. also let’s Bölzer ’s more progressive song-writing come to fore, with changing time-signatures and repeated riffs towards the end that will definitely put you in at trance! The Great Unifier in Bölzer at their most expansive. It draws heavily on their mid-paced death drawl and their black metal influences, with the German accented vocals adding more individuality to their sound. Again there are time-changes, but the transitions are so slick between them that you’d never know. At times it’s intense and maddening but other times it’s blissful, in a strange kind of way. Aura may only feature three tracks, but those these three tracks are a tremendous insight into the band for anyone who hasn’t come across them before. You can purchase Aura as a digital download from the Iron Bonehead bandcamp page. Likewise, there's also a link to purchase the MLP version, which you should definitely do!